Greetings, PMCers! We hope everyone had a great holiday! Judging by the results on this poll by Caustic1 that asked what your favorite part about Christmas is, spending time with family is by far what the majority of you enjoy most! You sweet people, you. "The Food" came in close second, nom nom, with "Gifts" at a close third. What was your favorite gift you received/gave? With the holiday season ending, so are a lot of the contests and events. In this edition of The Wall Post Weekly, we highlight the results of concluded events, emphasize those that are ending soon, and summarize this weeks activity. Did you see the article on Minecraft.net, Snowtacular Skins?! The article features our Winter Wonderland Event! Better yet PMC Members and event participants A1yssa, -bearwithme-, Tigerblink, BleedingBlack and An Intelligent Moron were for their skin submissions (Christmas Lights, Penguin PJs, Christmas Penguin, Rainbow Haired Christmas Girl, Whoever Thought of Giving Snowmen Hats and Scarves was a Psychopath, respectively). Congratulations to all! Speaking of the Winter Wonderland Event.....tomorrow is your LAST DAY to submit an entry! Make sure your submission relates to the theme! Anything wintry! Projects, Skins, Blogs or Artwork! There are some really creative and original submissions already (522 to be exact!). All participants receive a small pixel present to add to their trophy case! The Five Elements Skin Contest is in the Final Judging phase! The judges will be wrapping up soon! Good luck to the finalists and thank you to all of the members who participated! DinowCookie's Secret Santa event was a success! Check out this collection to see a variety of gifts made by our talented members! Friendly note: If you haven't given your gift yet, better late then never! Your Secret Santa has been looking forward to their gift for quite some time. We all are busy, but try to pull through! Wildcard_Gamer's Ugly Chrismas Sweater Community Collection is ending in 3 days. Use one of your favorite skins (made by you) and give it an ugly sweater! TODAY is the last day of Carcharodontosaurus' Bin Skin Contest! Create a quality “garbage” skin that follows the guidelines. This battle's theme is Horrible Character Customization – with special rules. You must use 3 pieces from the sheet given by Carcharodontosaurus (see below) Ready, set, go! BowManOfJustice's Skin Reshade Contest, For Glory!, wraps up on January 3rd. In their first ever hosted contest, your goal is to reshade the medieval skin they're provided. Their goal is to get 5 entries – let's help them get to their goal! Visit the Community Event Calendar Page for a full list of Events and Contests! There is now an Activity feed! Watch and discover new content and members with a feed of activity from PMC Community Members! Simply go to the “Community” drop down on the main navigation bar and select “Activity”. You also have the ability to sort by specific activities including but not limited to: Diamonds given, members subscribing, submissions favorited, etc. Tomorrow is your last day to find Topper! Topper will be easier to find because it's the end of the month. If you haven't noticed, Topper also learned even MORE emotes! Check out this blog post for a list of Topper's Emotes! In the beginning of December, BTWN submitted an un-decorated big, beautiful spruce tree for anyone to decorate! Throughout the month, they posted various YouTube videos showing their own progression! Check out their series "Mega Christmas Tree", to see several time lapses as well as the end result of this impressive work of art! Congratulations to _Phrozenbit_ for their successful server launch with 59 players in just 4 days. Their server offers two different types of Minecraft gameplay: Redstone Freebuild and Survival. Together they are setting an excellent example of how to setup and promote a new server on PMC. That's it for now. Have a safe and fun New Years! I never expected to be featured in a Minecraft.net article, But it seems i just, was! Happy Friday! It's been a fun wintry month and it's not even over yet! There's still time to enter Christmas and Winter Themed events! We've been busy this week working on a feature we think everyone will enjoy! This feature, along with this week's highlights are summarized below! Watch and discover new content and members with a feed of activity from PMC Community Members! WHY didn't we have this sooner?! 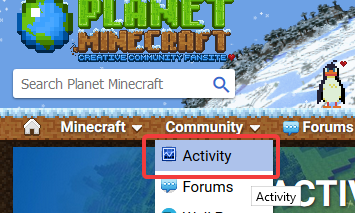 Simply go to the “Community” drop down on the main navigation bar and select “Activity”. Hazaa! You can pin the Activity feed to your nav bar by hovering over “Activity” and clicking the pin icon. Topper is in shock. You also have the ability to sort by specific activities including but not limited to: Diamonds given, members subscribing, submissions favorited... etc. Kiss hours of free time good bye! You're welcome. Speaking of Topper, have you noticed anything about Topper lately? Last week, Cyprezz reached out and asked the community for help with emotes and many of you responded with adorable (some, ambiguous) ideas! We implemented all of the animated suggestions and will continue to add them! Which Topper Emote is your favorite so far? Side note: If you want to be Topper, check out these Topper Skins! Here's an idea: Flood a server with Toppers! Side note #2: Topper should be behaving now, pacing back and forth on the header (except profiles). That goober just wanted to be all over the place! WINTER WONDERLAND Community Event! We've been noticing some winter/Christmas skins and projects that have not been entered in the Community Event. The event is OPEN to all mediums as long as it fits the “Winter” theme! You can submit up to 5 entries! The Five Elements Minecraft Skin Contest is nearing its' last days! You have 3 more days to work on/submit an entry! There are a few unique events up on the calendar including Romto_'s Serial Skinner game (season 1 sign ups are full, but keep an eye out for season 2 sign-ups! ), LaurenAngels_ Skinning Dares for You to Try Challenge, and DinowCookie's Looking Glass Seeking Game! These games and challenges are a fun and different way to be involved in the community! We're looking forward to seeing what types of entries and successes everyone has! Skin calendar Winter Skin Calendar! Wildcard_Gamer's own Elemental Skin Contest ended – the results can be found on their blog post. Congratulations to Kaos_Kitten, DinowCookie and Shady_Warlock! while shifting its main sources of energy” (hence the solar panels and glasshouses). Read more about their build in their interview and on their submission page (which includes a download!). Look for him in the top banner. Just keep refreshing the main/landing page of the site after logging in (so you get "credit" for finding him) and he will eventually appear upon page load. Also I never saw him with Chrome, only Firefox, but that might have just have been my own experience. Happy Friday! Whew! We apologize for the small crash there (you'll find out why below). With the Christmas holiday fast approaching, so are most of the deadlines for contests. We've also been behind the scenes working on a few fun features! Some of our PMC'ers had celebrate-worthy events/submissions this week, so be sure to check out the highlights below for more details! The Winter Wonderland Community Event is 2 weeks in! We're very close to 300 entries ranging from skins bundled up in coats, hats, gloves, and scarves to wintry scenes with penguins, snowmen, presents and... snow! You still have plenty of time to participate in this event and remember, you can enter up to 5 times!! The Five Elements Skin Contest has 10 days left. You have 5 Elements to choose from, which one will you pick!? PMC member canday (who has a rather festive profile!) Recolor Contest ends in 3 days! In this contest, you're provided with a grey scale skin. You get to color it with up to 4 of the 15 provided palettes. We love this unique concept! After a small hiccup, we've implemented mentions! That's right, you can now tag your fellow PMC Members simply by typing the “@” symbol and then the PMC member name! Not quite sure how to spell a member's name? The system autocompletes for you, pulling up suggested usernames based on what you've typed! Woo! On the previous Wall post Weekly, we asked you what emotes you'd like to see – instead of creating the emotes for you on our end, we're giving you the opportunity to make them yourselves! Details can be found on Cyprezz's forum post! Minecraft Skin Team Top Notch released their first Skin Pack - Village and Pillage! It's a completely FREE skin pack that consists of 12 Village and Pillage themed skins! Top notch is currently working on their second project – we're looking forward to seeing what they come up with next! 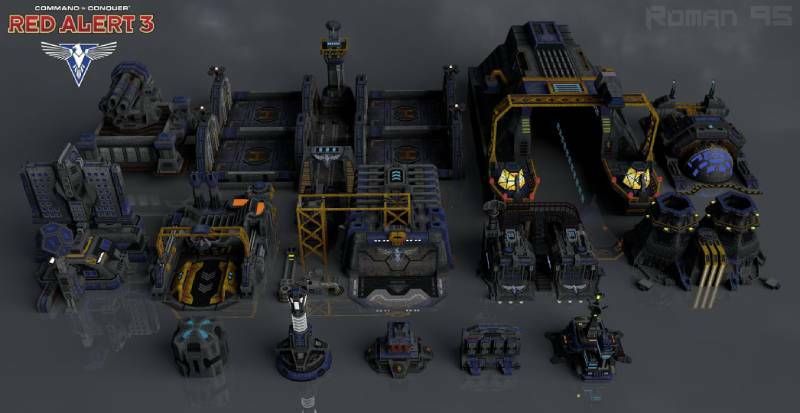 Roman_95 completed their Red Alert 3 Alliance Side Collection. They've been hard at work for 8 months in between their dinosaur and dragon builds. Their collection includes Vehicles, Aircraft, Vessels, and Structures – all intricately detailed and available for download so you can get an up-close look! Congratulations on the completion of your Red Alert Collection! In their first ever blog post, UghNamesAreHard made a tutorial on how to use the clipboard and clone mode in PMCSkin3D! They use screenshots to help explain these features, and their explanations are easy to follow. If you're overwhelmed, confused, or don't know how to use the clipboard and clone mode, this is very helpful! PMC Member Crazyarchitektor and Leonex were featured on Minecraft.net for their fantasy castle project. They go into depth on how long it took them (hint: it wasn't overnight! ), the materials used, and inspiration behind it! A good read! If you logged into your account between 12/11 @ 10AM EST and 12/12 @ 10AM EST, please review your notification settings. There was a bug that reset notifications when you logged in. It's been squished! Anybody wanna be my minecraft girlfriend? Thanks guys I work hard on these skins feel free to download any of them and let me know if you like my wolger tribe skins. Happy weekend and December 2nd! As you can see, the site theme is now WINTER and we hope everyone is enjoying all of the little icicles, snow, and feel of the site! It technically isn't Winter yet (December 21st is the official date!) but we're close enough – with snow, freezing temperatures & all of those fun winter-y things (in some parts of the country). We've been planning and preparing the themes, activities, and other little surprises for December, and we're excited for the weeks to come! Have you seen this adorable little pixel penguin waddling around? No? Well if you haven't, it's because Topper randomly appears, just like their predecessor Batty. Please be patient. You have an entire month to meet! Shout out to BIO, the artist behind Topper and Cyprezz for programming them to life! If you have any EMOTE ideas for Topper, comment below! MORE updates to collections!You can now pop out the Collections Manager pane (just like you can with the color picker in PMCSkin3D)! You can move the pane anywhere you want and it will stay when refreshing the page & browsing the site. 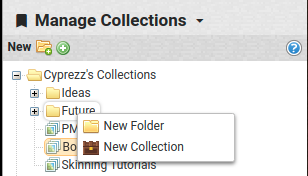 You can now right click any folder to create a new folder or collection in that folder instead of going all way to top of the collections manger. 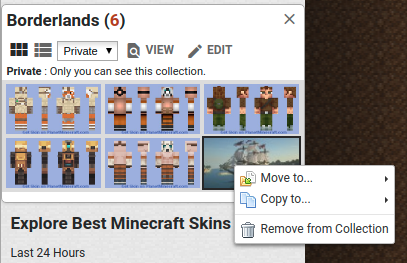 You can delete items from a collection by right clicking and selecting "Delete"
Added "Delete" confirmation dialog to prevent accidental oops. You can delete items from a collection on it's full page view while sorting by "Collector Order". Simply drag and drop an item into the dirt background / outside of the collection layout. We did it again! The Halloween Community Event was so successful that we decided to have another! To celebrate the season of Winter, the event theme is Winter Wonderland! Turn on some Holiday music, grab a cup of warm cocoa and create something winter-y to contribute to this festive occasion! If you participated in the Halloween Community Event, you know the deal. You can make anything you want, as long as it fits the theme! If you need a refresher on all of the rules and details (or if you're new and don't know how Community Events work) please visit the Event Page. We're looking forward to seeing what you all come up with and hope you have fun! Congratulations to the finalists in the Robot Skin Contest! We're currently in the final judging process and hope to be wrapping up soon. Sign-upsfor DinowCookie's Secret Santa Event are open until December 5th! What a FUN way to celebrate the Holidays! TsukiaKari is celebrating their 400 sub milestone by hosting a small Community Event that includes a skin raffle, community skin, and skin contest. Head over and check it out! You could be the one who wins a skin of your choice from them! That's all for now! We hope you all have a great week! A happy late Thanksgiving to the U.S. Members & a happy weekend to everybody! We read everyone's responses to our previous Wall Post Weekly. It sounds like there are some lucky people who didn't get a speck of snow, while others faced flight cancellations! Enough with the chitter chatter, let's get down to business! BATTY: In case you missed it, you now have the ability to "dismiss" Batty. Simply Go to your Profile and click on Batty! You'll have the option to "Dismiss for Now" (see image below). Batty will relocate to your Trophy Case! You can summon Batty back to your profile by going to your Trophy Case, and hitting the blue "Summon" button. MORE updates to collection management! You have the option to Move or Copy an item in a collection to another collection directly from the collection management panel! Just right click on the item you want to move or copy! 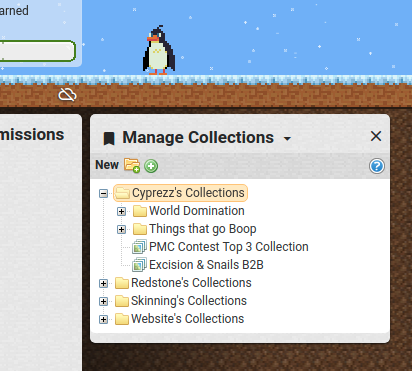 Manage Collections : collections ordered alphabetically. Fixed bug where main navigation appeared over the widget manager. We're working on a couple of things for the Month of December. Stay tuned! There are 2 more days left to submit an entry for the Robots Skin Contest! There are 309 entries! As Romto_ pointed out in their wall post, the last time we broke 300 entries in a skin contest was back in November of 2016 when there were 350 entries in the Magic Skin Contest! Woo! Do you think we can break the 350?! There is 1 DAY LEFT in snowylemons Reshade Contest "Sisters"! Sign-ups for Chiaroscuro's writing contest - Season 3 - are still open! There are only 2 spots left! Details can be found on the Sign-Up Page! Visit the Community Event Calendar for a complete list of Events and Contests! This week, PMC Member ArchiGa was featured on Minecraft.net! The interview highlights their submission, Cælestes Horti / SkyGardens, which was an entry in the Sky Scraper Project Contest! ArchiGa goes into detail about the inspiration behind the build, the length of time it took to create it, and gives insight about the build in its' entirety. Congratulations, ArchiGa! Guide on using the entire site in general. Happy FRIDAY PMCer's! Did it snow where you are? Enough to make a snowman or cancel school? Here's a summary of this week on PMC! Updates!! The most noticeable update was the new nav bar, XP bar, and PMC Logo in the header. It may appear that these changes are the only updates on the site... but they're not! "There was a pile of improvements all over the site that had nothing to do with the site theme and physical changes. For example, I integrated 'lazy loading' of images which should speed up the site on both mobile and desktop - saving bandwidth for us and you!" You can read more about the update in replies to questions on his wall, which you can view here. There were many updates to the Collections system! We also updated the Collections Tutorial, which includes new, detailed explanations, newly added GIFs, updated photos, and more! Let us know if we missed anything by commenting on the tutorial page! Another major update was with PMCSkin3D! Did anyone notice that you can now edit ANY MOB?! Chicken, Cows, Dolphins, Sheeps, Squid, and SO many more. Only player model textures can be published.....for now. wink. Simply launch PMCSkin3D, select " File > NewSkin ". Click on the drop-down menu (Steve is pre-selected) and choose your mob! Easy peasy! One final thing. Remember Batty? 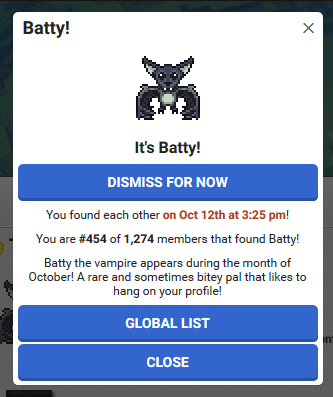 Chances are, Batty's still hanging around your profile but you now have the ability to "dismiss" Batty, relocating Batty to your Trophy Case! You can summon Batty by going to your Trophy Case, and hitting the blue "Summon" button. Batty will re-appear on your profile! October's Official Contest Results wrapped up. Congratulations to the winners! Results are summarized below, but be sure to check out the final leaderboards to see some spooky, fun and festive entries! 2nd place winner Aspirin60 with their skin It's Alive and Free!! This month's skin contest theme is ROBOTS! After months of being on the community poll, it finally had majority vote! There are about 10 days left to enter! We're looking forward to seeing some creative computer creatures and reading equally imaginative stories about them! Sign-ups for Chiaroscuro's writing contest - Season 3 - are still open and will remain open until the maximum of 16 members sign up! There are already 10! Details can be found on the Sign-Up Page! Skin Events & Contests ending soon! That's all for this edition of the Wall Post Weekly. Have a great weekend, and stay warm (or cool)! You can have some of ours, it came about a month early! i wish we had snow! it usually comes around february in the uk. Every extra special thing we've done on the site this month is because of this Holiday, and it's finally here! Let's recap the eventful month! One of the most noticeable special spoops was the site theme! Bats, leaves, pumpkin-orange buttons.. oh my! Along with the appropriate site theme, a lot of members decorated their personal profile in cobwebs, creepy-crawlers, and spooky scary skeletons. We really enjoyed seeing everyone's profile transform! So festive and creative! The orange buttons and leaves aren't going anywhere just yet - they'll stick around through the fall season! The FIRST ever non-competitive Community Event was successful, to say the least! The Halloween Community Event wrapped up yesterday and we are impressed by the quality and number of submissions and support you have given each other! Head on over to check out the Event Summary which includes a few featured submissions! We appreciate all of the hard work and effort you put into the event and needless to say, it won't be the last of its kind. Pat yourselves on the back and give each other high fives! Special thanks to DinowCookie for helping host and coordinate the event! Let's talk about the friendly phantom creature that's been hanging around randomly – BATTY! Many of you have already found Batty, and if you haven't, don't fret! You still have the rest of today to find Batty, and it should be easier because it's Halloween and it's Batty's favorite Holiday! Here are some fun Stats about Batty! Fun Fact: Batty wasn't in our original plans for the month, but when the seed was planted it grew and we're happy Batty was well received! Batty feels very welcomed and thanks to the community for being so friendly! Batty showed up 22,205 times for members only! 15,428 members saw but never claimed Batty! In addition, our official Laboratory Experiments Skin Contest received 240 entries & is currently in the judging phase! There were some beautiful and unique creations & equally original stories along with them. The Pumpkin Carving Contest JUST entered the review phase which means there's still time to look over the entries and diamond your favorites to ultimately determine the finalists! Alongside our official community events & contests were 6 unofficial Halloween themed events & challenges hosted by your fellow PMC friends. November will be a little quieter than October, but be prepared when December rolls around....! PS If you read all of this, THANK YOU! Have a Happy Halloween and stay spoopy! We hope everyone had a blessed one! Holy SPOOP! How is it Friday already?! Not complaining, because we're THAT much closer to Halloween!! Who's going to a Halloween Party this weekend? What are you going to be? Something scary? Cute? Funny? Comment below, we're curious! It's the LAST weekend to work on your pumpkin for the Pumpkin Carving Contest & submission for the Halloween Community Event! The Laboratory Experiments Skin Contest has come to an end, which means its time to vote on the next theme! There are 2 new themes - Norse Mythology and Fashion Show. We also want to take this wall post opportunity to introduce our cute furry friend, Hallo-kitty! He can be your furry friend, too! Everyone who participates in the Halloween Community Event will find Hallo-kitty in their awards & trophy case! Pixel art hand-crafted by Cyprezz. Don't forget to visit the Community Event Calendar for unofficial & official community events & their deadlines! Hint: a lot of the October events are ending soon! Sadly the month of October is winding down. You have 5 days left to submit your entry into the Official Laboratory Experiments Skin Contest and 10 days left to submit an entry into the Official Pumpkin Carving Solo Project Contest. Artsy_Lady is celebrating 200 subscribers with a Skin Remake Contest which ends in 2 days. TsukiaKari is also celebrating a milestone. She's been a member for 1 year and is throwing a skin contest in which you design/remake one of their OC's. Her skin contest ends in exactly 1 week! CaelChan's contest, Writefully Inspired Skin Contest, is a combination of writing and skinning and is a result of her subscriber milestone. Ends in just 2 days. For a COMPLETE list of all events, visit the Community Event Calendar. Your fellow spoops would love and appreciate your support! Here's a summary of the fun and exciting things happening on PMC. Which ones have you joined? Which ones are you thinking of joining? By the way, have you seen Batty?! That little creature....sure has a mind of its' own! We have 2 official contests running this month! The project contest theme is Pumpkin Carving! Whether it's scary, funny, spooky, based on real-world carvings or only possible in Minecraft, the size & carving is up to you! This month's skin contest is Laboratory Experiments. What do you get when you mix blood from an albino rat and a drop of Chanel No.5? We don't know either. The point is...use your imagination! Come up with a crazy backstory of an experiment gone wrong, or...right! Our official community event is off to an amazing start (*applauds*) with over 300 entries! Remember, this is non-competitive, multi-category event! Purely for fun! PLEASE READ the event rules. We will disqualify if your entry doesn't follow the rules or fit the theme! Every participant will receive a special award for their participation! Woo! PS Your profiles are all AMAZING, all festive and stuff. You spoopy spoops. ATTENTION Skinners, aspiring Skinners, and members who don't know that they want to start Skinning yet! Beanie has created a lovely, detailed, YouTube tutorial on Skin Basics using PMC's very own advanced online skin editor, PMCSkin3D! Not only does she teach you the very basics of skinning, she goes over the important elements of PMCSkin3D to help you learn how it works! If you've ever opened PMCSkin3D and have given up due to the overwhelming "bells & whistles", watch this tutorial and see if it helps! If you need further assistance, you can visit the Help & Tips Page or ask a specific question on the Skins Forum! xD when I was watching the tutorial thingy at 19:43 I noticed my skin was turning backwards! nice but whenever i try to upload a world to pmc it doesn't work. Or else what? Getting free pumpkins for pumpkin pie? Hey everyone!! REMINDER! This is the last weekend to work on your submission for the Superhero & Supervillain Home Bases contest! Get those entries in by MONDAY 12PM EST! Who loves Halloween?! October is right around the corner and we couldn't be more excited!! Halloween is our favorite, so we're gearing up for a fun and spooktacular October!! Has anyone picked out their costume? Themed contest Writing Contest "Future"
Reshade contest "He's speaking, speaking for me"
Colors contest "Use these colors"
Hello Asendra, I am commenting with a question. On your map "Abyss" Headquarters Basement there is no download, and I respect that because you worked hard on it. Is there any way though that I could download the map, I would be willing to pay money for it.